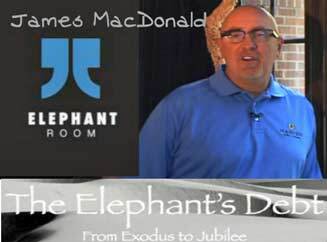 In Elephant Room Curator James MacDonald And The Elephant’s Debt and Latest As James MacDonald Addresses Detractors At Harvest Bible Church here at Apprising Ministries I’ve been covering what seems to be a developing story concerning Elephant Room curator James MacDonald and a website called The Elephant’s Debt: From Exodus To Jubilee put up a two former members of his Harvest Bible Chapel. Christian Research Network Associate Editor Erin Benziger of Do Not Be Surprised… brings us a solid synopsis as to where the story stands currently in her post James MacDonald, Harvest Bible Chapel And The Elephant’s Debt: A Summary. Then on the October 8th edition of his Fighting for the Faith program Christian apologist Chris Rosebrough of Pirate Christian Radio also examined the issue of MacDonald, HBC, and debt. With this in mind, we think back now to Elephant Room 2, which curator of the ER convened with his co-host Mark Driscoll. What was particularly of note, and came as a surprise to some, was that ER2 would be used to mainstream T.D. Jakes, one of the most blatant of all Word Faith prosperity preachers. However, if you were paying attention to the January 2012 Code Orange Revival of two-time ER vet Steven Furtick , which featured Jakes you’d have seen that coming. Many of the same names around the ER and that aforementioned emerging ecumenical evangelical magisterium were there as Furtick would proudly announce: T.D. Jakes Is My Favorite Preacher In The World. What all of these in this magisterium have in common is that they pastor multi-site churches; these magachurches, with all of their Internet bells and whistles and massive video streams, have huge technology bills to pay. Now consider the economy along with their “numbers are king” philosophy. You should be able to see that they have no choice but to continue trying to expand their little kingdoms. By their own mythology dreamed up by the Church Growth Movement, from which this current cult of church-planters hatched, if they don’t bring in the numbers 1) they’re then considered failures by their peers, and 2) they’ll go out of business. It may now become a clearer for you why we beginning to find these Seeker Driven and Word Faith megachurch pastors welcomed into the Reformed camp. James MacDonald and Mark Driscoll are basically in the same boat as guys like prophet-leaders like Rick Warren, Steven Furtick and his pastor Craig Groeschel. They all have a real pressing need for increased financial resources. So, the revelation comes: Jesus would be pleased if we try and bring unity within the Body of Christ through embracing WF preachers like T.D. Jakes.